Enjoy your food with a specially selected, reasonably priced bottle of wine. 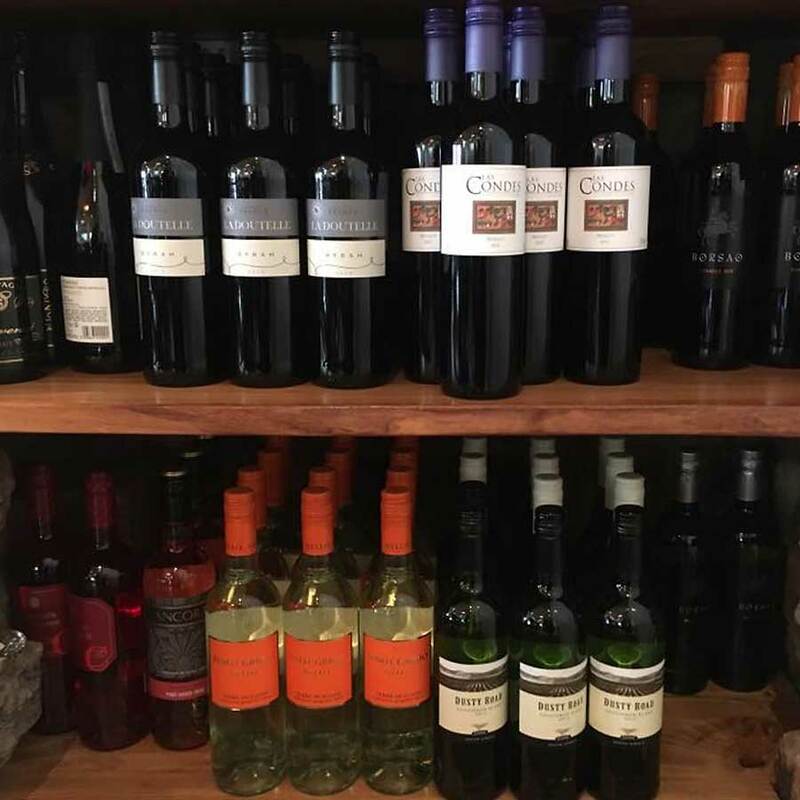 You will find lovely house wine alongside an Ian Brown selection of European, New World and South American and South African Whites, Reds & Rosé and sparkling and Champagne. We are also happy to offer wine matching advice with each course. Gentle aromas of sugared almonds with a crisp, off-dry flavour. Soft and clean with mild spice hints. Flavours reminiscent of Cape gooseberries and a hint of grass. Dry and zingy finish. Fresh and lightly savoury aromas of peach, lemon and fennel. The palate is full of peach and cashew nut characters with a clean fruity finish. Easy drinking wine with bags of juicy bramble fruit flavours and just a hint of spice. Aromas of wild black fruit with a peppery finish. Great with red meat dishes. An attractive nose with ripe red and stone fruit overlaid with a herbal quality. On the palate these develop to show ripe plum and prune flavours. Fresh, dry and crammed with summer fruit flavours and aromas. A different and very exciting angle on the Pinot Grigio variety. 100% Sauvignon Blanc. This lovely dessert wine has a complex, tangy honey flavour combined with ripe, crushed orchard fruits. Classic Sauvignon Blanc with tropical fruit, white pear and citrus aromas, which follow through onto the palate with a crisp, clean finish. A wine of great finesse and elegance. Made in a honeyed and mealy style, with creamy richness over apples and minerals. Tang of sour lemons with a bite of endive. Aromas of pear, crisp green apple and honeysuckle. On the palate you'll find apricot nectar, orange zest and baked sweet pineapple nuances with a hint of toasted coconut. A dry white with a light and delicate in style, pale gold colour and fresh fruit, floral aromas leading in to a refreshing palate. Delicate lemon and jasmine on the nose with crisp green apple and lime acidity, balanced by a hint of sweetness. A honeyed, floral sweet sauvignon bouquet and then loads of fruit in a fresh, dry, zesty flavour with nuances of gooseberry and melon. Lovely and pure with a perfumed nose of honeysuckle and pear. This reflects onto the palate and is balanced by some tropical fruit and lovely mineral fresh acidity. Floral honeysuckle, ripe fig and melon scents are rich, full-bodied, elegant and refined, showing a light touch of toasty vanilla oak on the finish, where the flavours turn subtle and delicate. Good Domaine bottled Chablis from a respected producer. Nice honeyed Chardonnay fruit on the nose, with clean, crisp, steely fruit on the palate. A beautiful wine with a light golden pale robe and greenish highlights, with muscat-like aromas and notes of liquorice. A mouth-watering Sancerre with bags of refreshing acidity and minerality, plenty of up-front fruit and great depth of flavour. Well-structured wine with wonderful red berry and blackcurrant aromas and flavours. Classic in style with a well-rounded palate and a firm finish. Plum red in colour with a delicate nose of black fruit, walnut and light spices. Made from 100% Tempranillo grapes. An easy-drinking wine, vibrant purple in colour, with bright fruity notes of black cherry and plum. Fresh and easy bouquet, deep in colour, with a lovely, supple, red and black fruit character. Garnet red colour with purplish reflections. The nose reveals aromas of red fruits, leather and spices. Fine structure with charming, powerful tannins. Notes of dried fruits and spices on the palate. Superb balance and concentration of black cherries, herbs, spicy black pepper and a touch of chocolate. Ruby red in colour with cherry and chocolate aromas, and a dry, velvety flavour full of spicy, cherry fruit. An outstanding example of Valpolicella. Richly layered, with flavours of wild berry jam and red grapefruit rounded out with secondary flavours of rich molasses and a touch of warm baking spice. Full fruit on the nose with a hint of cigar box. A rich, dry flavour with just a whisper of raspberries and excellent length. Light and easy-drinking. Rich, full-flavoured wine with fruity/smoky aromas, a lush, fruity palate and firm but unassertive tannins, balanced by gentle acidity. 100% Nebbiolo giving a classic rich wine. Violets, roses and spices on the nose and packed with winter fruit flavours. Pale, light yellow in colour with a delicately fruity, slightly aromatic nose, well balanced fruit flavours and a light body. Vivacious Rosé with fine strings of bubbles, aromas of wild strawberries and an elegant, well balanced palate. A subtle and elegant Champagne with floral aromas and on the palate a freshness and harmony. Established in 1811, Perrier Jouët is a revered Champagne known for its complexity and delicacy. Fresh and lively with classic brioche flavours, complimented by peach and floral notes.